On a gloomy day, I found myself having breakfast on Eastney Esplanade, watching the seagulls battle the oppressive wind. I was sat in the popular Southsea Beach Cafe which is found just next to South Parade Pier. For so long I had heard good things about the seaside eatery and seen beautiful photos of it on Facebook. So, it was no wonder that I had always wanted to go. Sadly, my luck had run short when the heavens started to open. I entered the cafe doors looking like a drowned rat with dripping hair and running makeup – the entire set. The waitress smiled at me and sat me down, next to a large heater and window. I rinsed my coat, hung it on the back of my chair and grabbed a menu. Immediately, I was shocked with its size and yes I am still talking about the menu. They had a wide range of breakfast, lunch and kids items with lots of vegetarian and vegan choices. A few that popped out included American style pancakes with caramelised bananas and raspberries, Morrocan spiced vegetable curry and steak frites. They had a lot of drinks too including wines, Belgian beers, smoothies and six different hot chocolates. There was the ‘fully loaded’ with marshmallows, cream AND a flake and the ‘salted caramel rum hot chocolate’. Que drooling. What was even better was the price. A main meal would cost you between £8 and £10 and a ‘fully loaded’ hot chocolate would cost a mere £3.50. I was impressed because with such a great location you would expect a far more costly meal. As I was sitting there, I realised that they were only serving breakfast so I ordered myself a vegetarian breakfast and solemnly stared at the Morrocan curry and steak frites. I also ordered myself a beachside smoothie with bananas, strawberries and apple juice. The waitress flashed me a grin and hurried off to the kitchen as I started kicking myself. Why had I not ordered myself a decadent hot chocolate? I guess I was still sticking to that ‘new year, new me’ mentality. Who knew being good would be the bad thing. As I waited for my food, the heater next to me was warming me up quite nicely. The wind picked up outside and the roof and walls of the beach cafe shook violently. At first, the incessant banging was humorous but, after a while, it grew annoying and stripped away the atmosphere. That’s my fault for visiting during a storm. More interestingly, was the number of other people. Even with the horrendous weather, the cafe was half full and many more people, like me, tucked into their freshly cooked food. 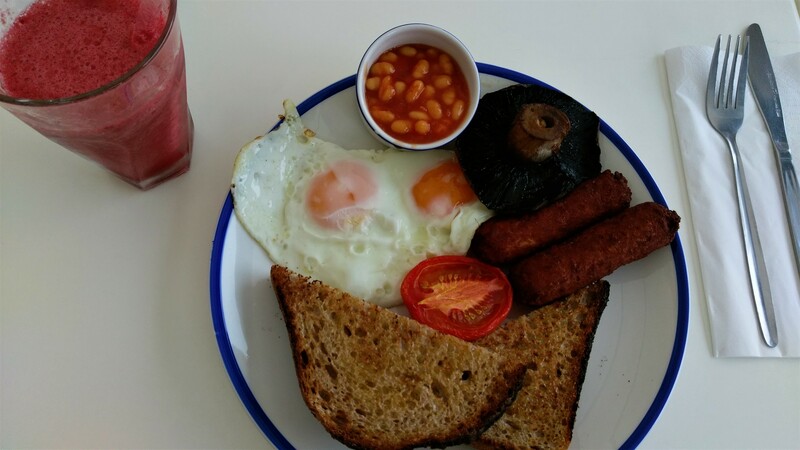 My vegetarian breakfast was served on a tin plate with two fried eggs, two vegetarian sausages, a pot of beans, a tomato, a mushroom and two slices of thick, buttered sourdough. All of this was only £7 but, when it was placed in front of me, I wasn’t too keen. With all the good reviews of the cafe, I had obtained some high expectations. I thought the presentation was a bit lacking but, ultimately, all that matters is the taste. The sausages were nice and fragrant, a tad spicy too, and the mushroom was huge. The eggs were okay with a runny yolk but they weren’t anything special. They were just two fried eggs. It filled a hole regardless but it had nothing on the breakfasts at the Tea Tray. As I paid up the waitress she wished me luck with the wind and rain and flashed me another bright smile. I left, not too impressed with my food, but still intended to return. The prices at the Southsea Beach Cafe and the range of food items, for meat-eaters and vegetarians alike, were all pros. But, the atmosphere and location were what really made it for me. Sadly, the quality and presentation of the breakfast let it down. With all the high praise of the cafe, I expected a tad more but it may have been an off day. After all, there was the rest of the menu to try and I still needed to get my ‘fully loaded’ hot chocolate. 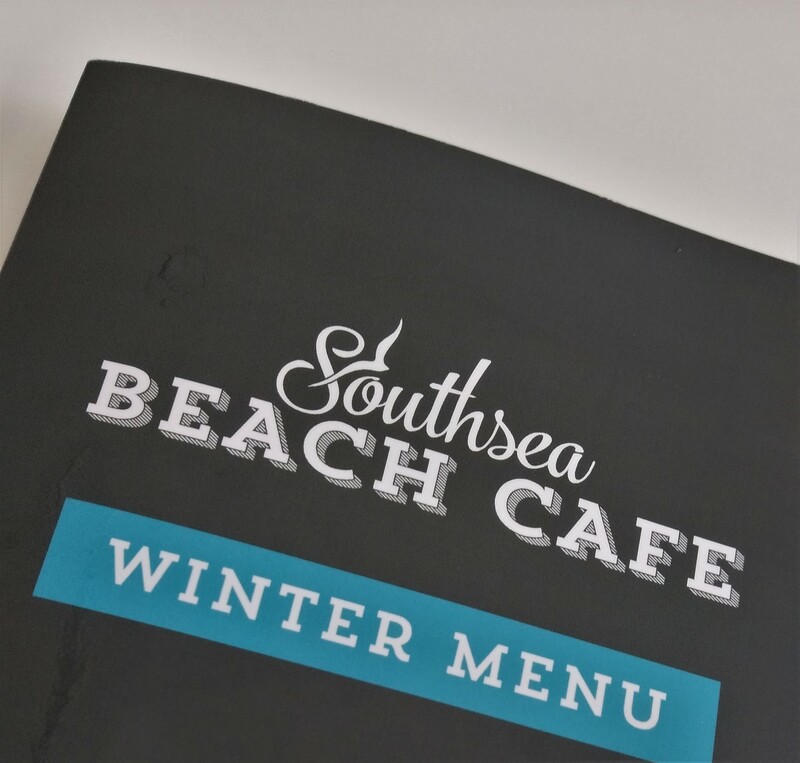 At the very least, the Southsea Beach Cafe would become a great new spot to grab a drink, sit down and watch the waves roll in and the seagulls drift past.